Ok, don’t judge….the other day I only ate a piece of Ezekiel bread with Nutella and half a bag of Kettle Popcorn between 6am and 5:30pm. Ummmmm, I have my moments of health-freakishness….but mostly I am just trying to grab bites in the midst of craziness. Ok, the Kettle Popcorn wasn’t my fault, it was just a bag that my hubby (yes blaming the husband) left in the car and I had forgotten to pack a lunch 🙁 . Here’s a peek at my frenzied day: I began with driving the carpool to school, then running out to our commissary to have papers filled out, then out to a meeting with the drama director for my kiddos Christmas musical (since I’m the music director and my aunt is the drama director…gotta looove small town), then out to Zoey’s Home Consignment to drop off another super cute piece of Zest it Up furniture, then meeting up with Sam to run errands (aka Home Depot and the Good Will Outlet), then out to pick up the kids from school and then back home to throw things together for soccer practice, then home to help with homework and cook dinner before bedtime. Now, can you blame me for running amuck with nutrition?? Oh well, win some and loose some. The gain was scrambling to the fridge and pantry to create a new dish outta necessity (that has been my usual M.O. lately). 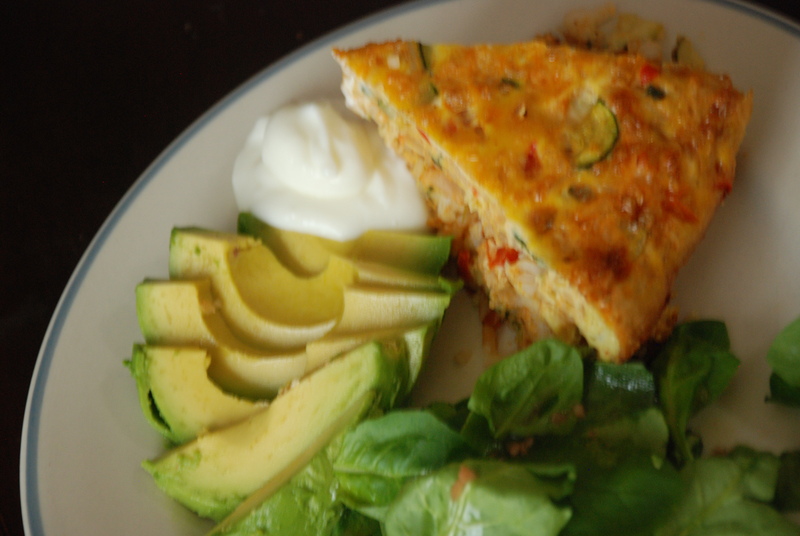 So, here is a quickie dinner that may help y’all conquer the world, too! 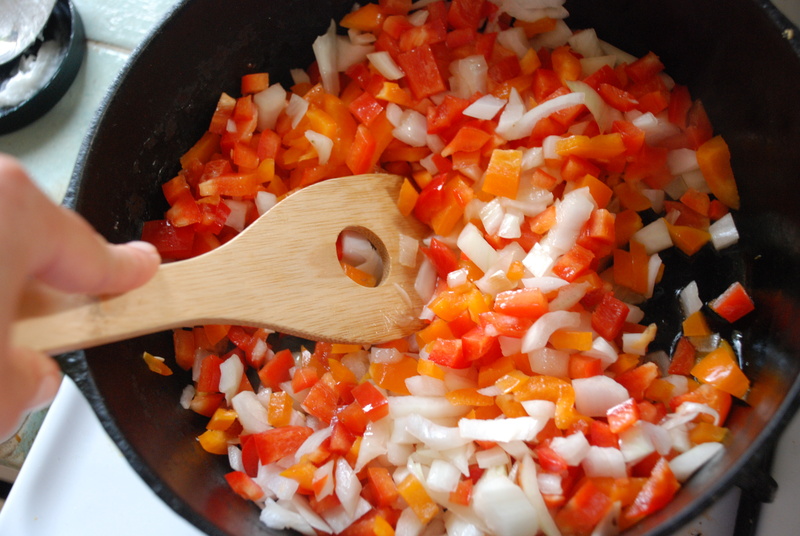 Chop up and saute one yellow pepper, one red pepper and one onion. Add a packet of your favorite taco seasoning (the low sodium version doesn’t really work because of the high veggie and rice content of this dish–both are salt zappers, and you don’t want a bland dinner, yuck!) 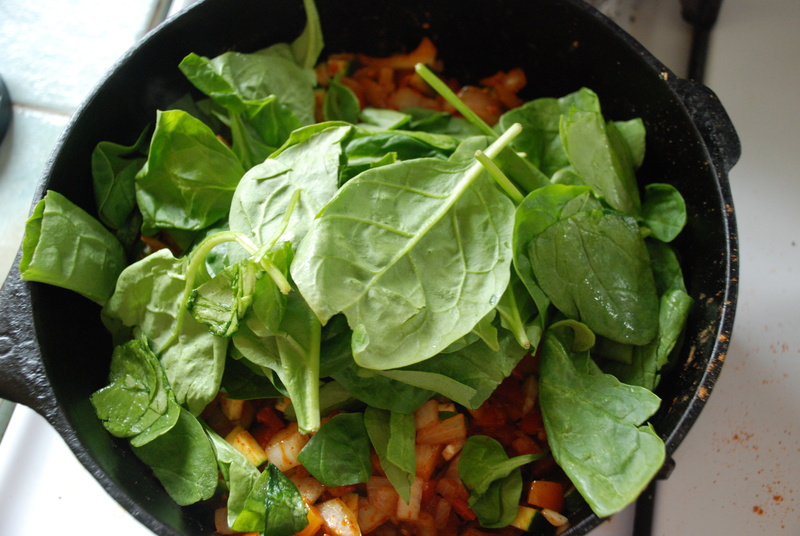 Now chop up and add a zucchini and a handful of fresh spinach (if you have picky eaters in the house, then you better chop the spinach small 🙂 ). 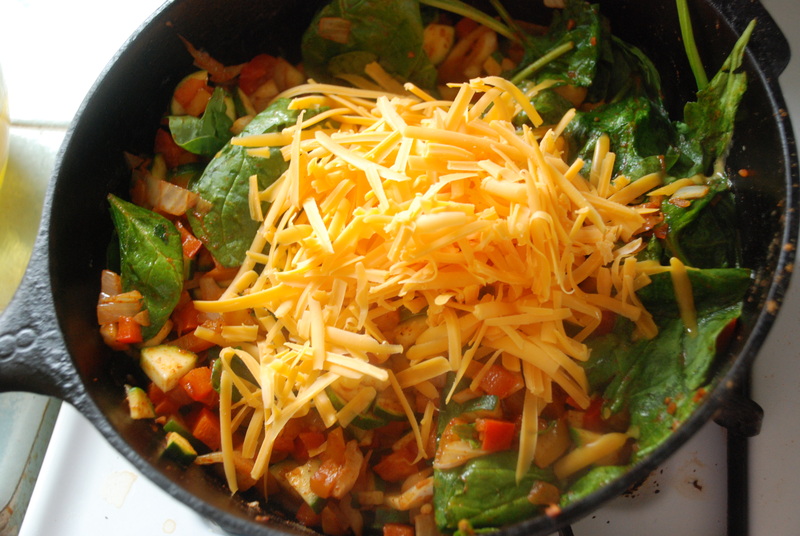 Add a cup of shredded cheddar cheese…I like extra sharp cheddar! Here is where I dumped some leftover rice into the mix…next time I am gonna cut down on the volume of rice, though. I think 1 1/2 cups would have been plenty…living and learning! Toss it all together….oh, it’s looking purdy! Hahaha, couldn’t resist including my hen eggs in this shot…but there is no way that my three ladies coulda’ supplied me with the dozen eggs I used for this dish. Now whisk away! 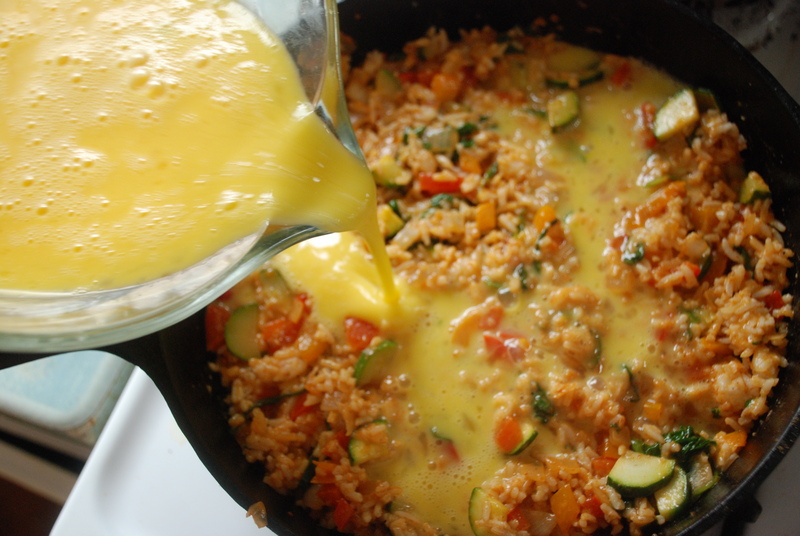 Gently pour your eggs over the veggie and rice mix. 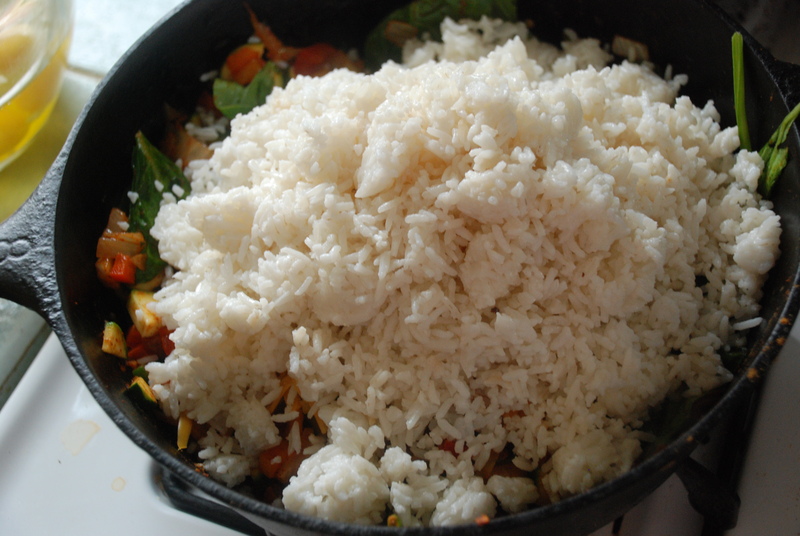 The veggies and rice were so dense that I had to lift and push things around until the eggs could settle in. Now, it was time for the baking. 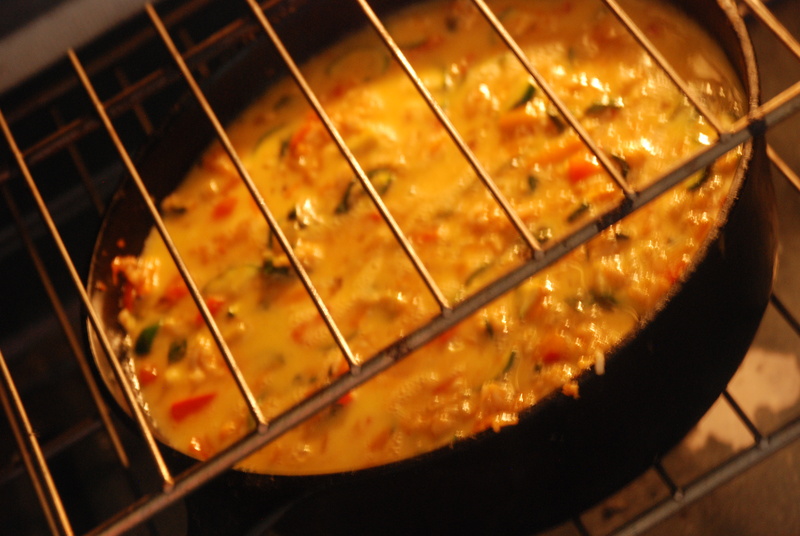 Good thing frittatas are pretty quick, since the mixture was already nice and hot in the skillet. Bake away at 400* and check on it in 15 minutes. Let it cook until it is puffy and browned. Yum. 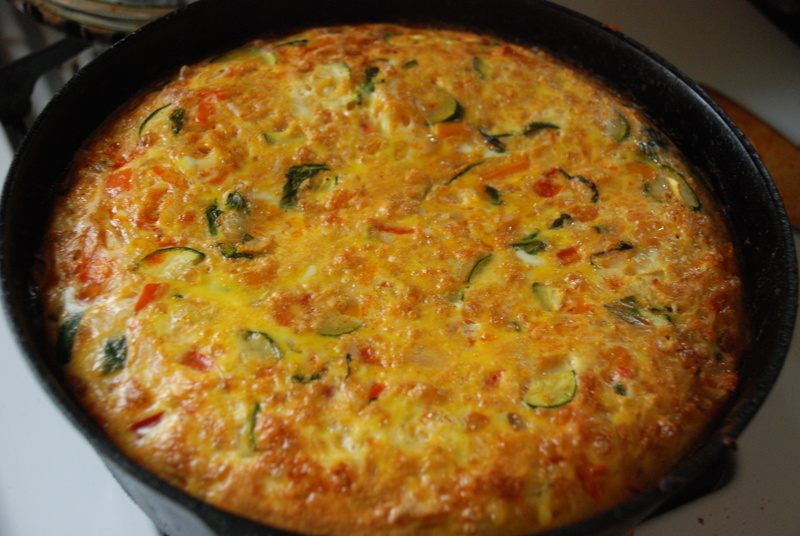 Thanks to the taco seasoning, this fritatta tasted amazing with sour cream and avocado. Of course, I doused mine in hot sauce. Finally, nourishment! This dish was healthy and quick. Next time you have a crazy week night and you have gotta get something on the table, give this recipe a whirl! 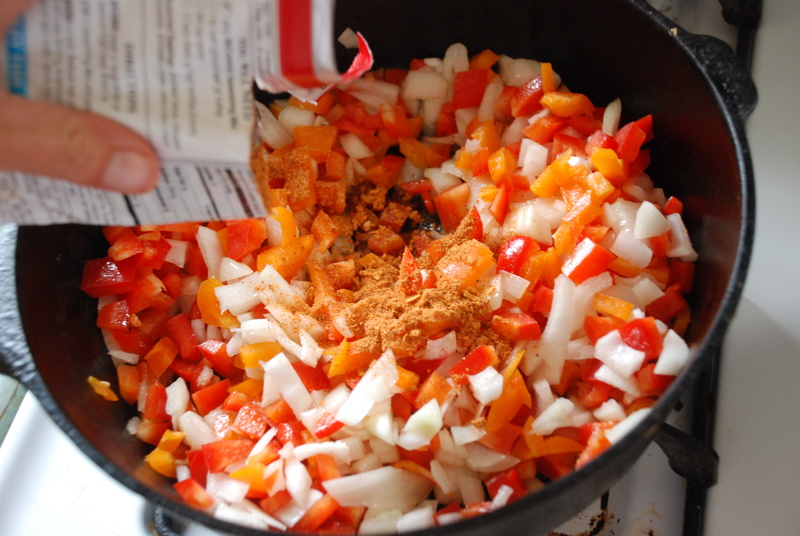 Saute the peppers and onion until soft. Add the taco seasoning. 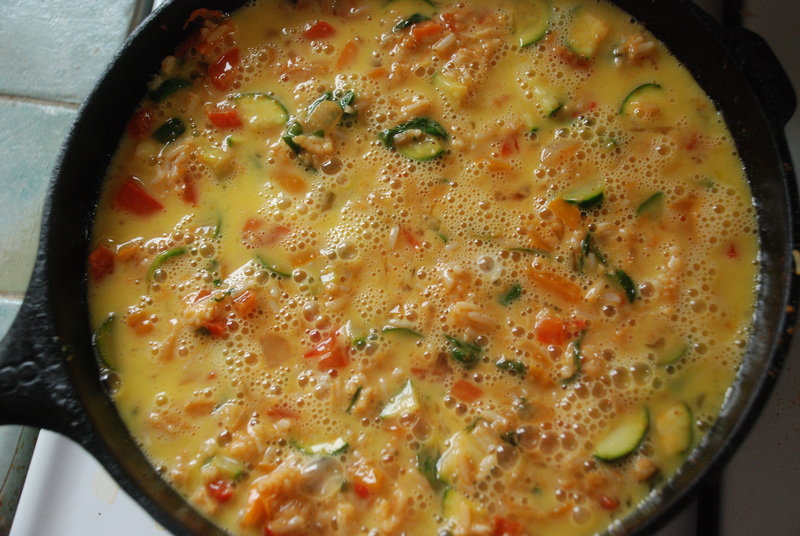 Add the zucchini, spinach, cheese, lemon juice and rice. Stir and saute. 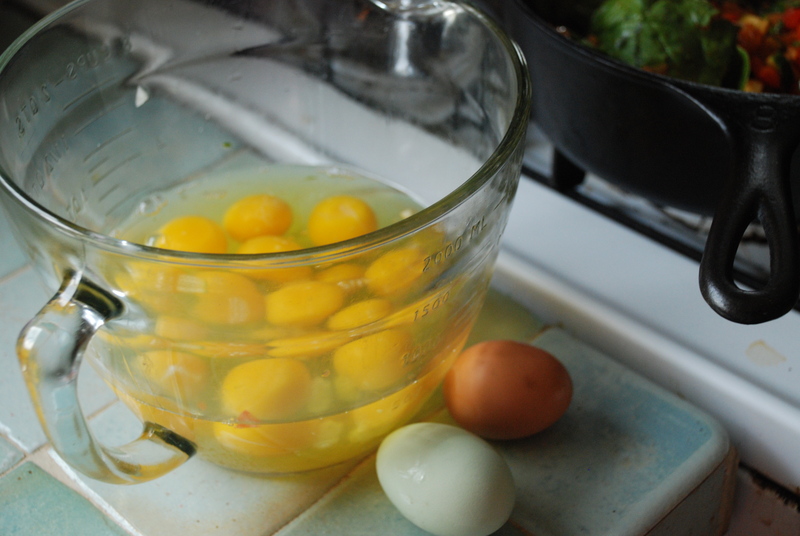 Whisk together a dozen eggs. 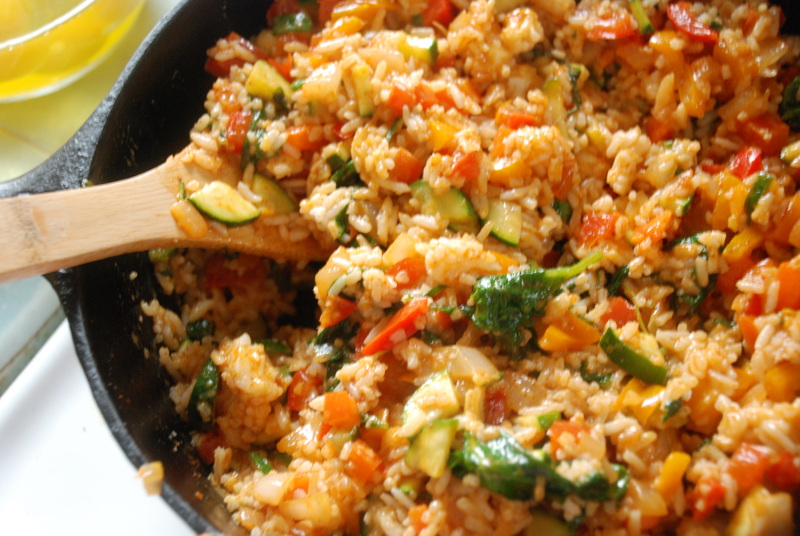 Gently pour into the skillet with you veggie and rice mixture. Bake at 400* for approximately 15 minutes. Check on it…it should have puffed slightly and look golden. When a toothpick is entered in the center, it should come out clean. Slice and serve with sour cream, salsa, guacamole, or anything that floats your boat!